New Brunswick, N.J. – While it is commonly thought that human and animal interactions have a positive impact on both the human and animal, previous studies has only focused on the impact that Equine Assisted Activities & Therapies (EAAT) has on people. Used for the first time since its creation, the study was funded by the Rutgers University Equine Science Center’s Gwendolin E. Stableford Endowed Equine Research Fund. In what might be potentially groundbreaking research for those interested in EAAT as a way to help veterans with Post-Traumatic Stress Disorder (PTSD), this study was one of the first trials conducted that focused on not only the effects on the human side of this type of therapy, but also on the horse. 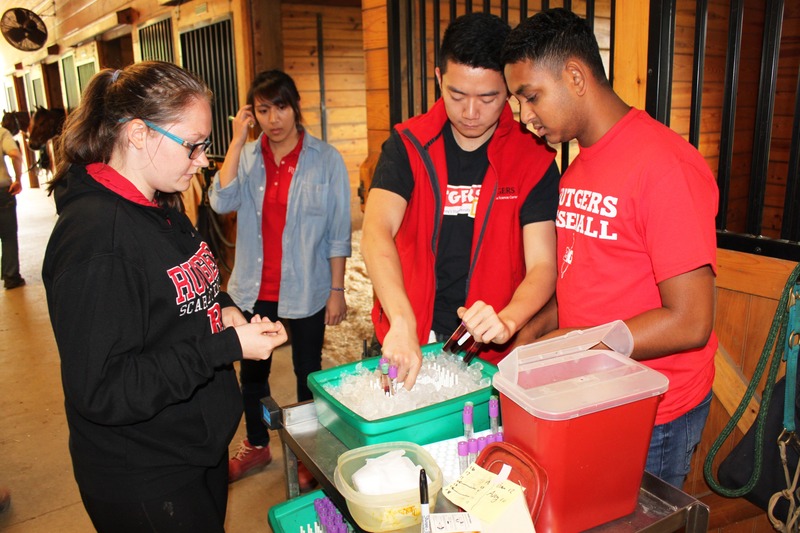 Undergraduate students from the Department of Animal Sciences place blood collection tubes on ice in order to preserve the samples. The study was conducted at the Monmouth County Park System’s Sunnyside Equestrian Center in Lincroft, New Jersey, for five consecutive days in April of 2016. Sitting on part of the 135-acre site and preserved as open space by the Monmouth County Board of Chosen Freeholders, the Sunnyside Equestrian Center works closely with the community to provide therapeutic riding and activities to people of all abilities. Volunteers who directed and serviced the EAAT sessions came from SPUR (Special People United to Ride), as they guided seven veterans from Lakewood Veterans Affairs during the trial. Blood samples were used to look at specific markers in the blood, such as the hormone oxytocin, which is frequently described as the love or happiness hormone. “To our knowledge, this is the first report of the measurement of oxytocin in horses used in EAAT programs” stated Malinowski. “If the concentration of this hormone increased during the trial, we would be able to suggest a positive effect on the horses.” The other hormone that was analyzed was cortisol, or the “stress hormone.” An increase in this hormone could indicate that the horses were stressed by their interactions with the veterans. 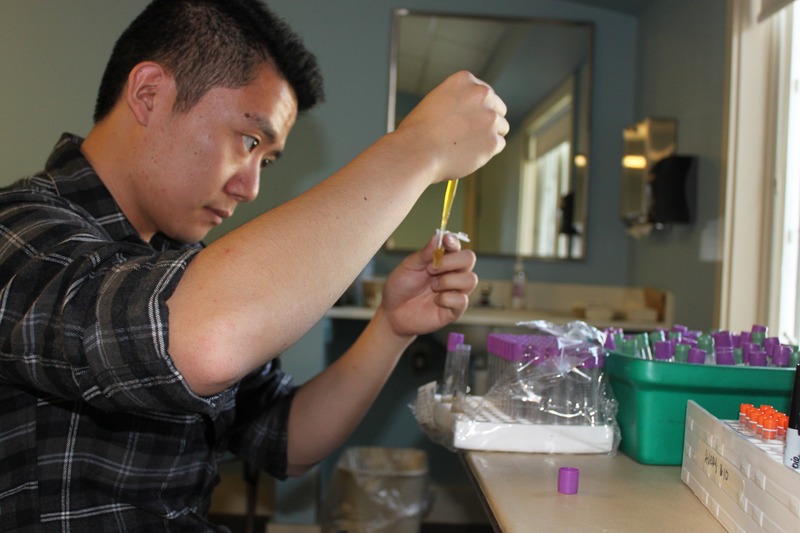 Chi Yee (SEBS ’17) aliquots blood serum samples for cortisol and oxytocin analysis. 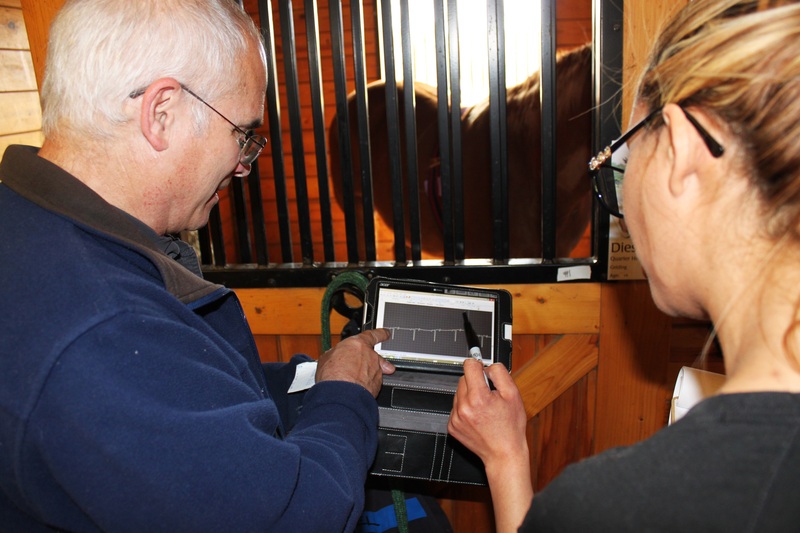 Rutgers students from the Department of Animal Sciences were shown the proper method of attaching and securing ECG monitors to the horses so measurements could be taken throughout the session. The readings from these devices allowed the team to look at heart rate variability, or the natural variation in time between consecutive heart beats. Dr. Ric Birks shows Department of Animal Sciences undergraduate students how to analyze ECG readings in real-time. Because this was a pilot study, Malinowski recommends further research be conducted with a larger number of horses, and a potentially longer time frame, to study the long-term impact of EAAT on horses. She would also like to add heart rate variability measurements and blood sampling to the human side of any additional research as a way to better evaluate the interactions between horses and humans.